I’m a city hall reporter. And it’s budget time. If you’re not familiar with what that means, it’s the series of meetings where your council representatives decide how to earmark hundreds, thousands, millions of taxpayer dollars for the upcoming year. It’s not that I don’t like numbers. They just collide with the literature and grammar notes in my head and then they proceed to blow up catastrophically until 1. I have a headache or 2. I ask Derek, my math/science/engineering whiz of a husband. Since I’m covering new cities, I’ve been dropped into a place where I don’t know the background and all the key players. That means a lot of research and a lot of extra work. But when I finish the article and the math in my story adds up, there’s a feeling of victory. I was thinking about that as I sent my latest budget story to my editor. It’s not that I don’t like being faithful. Sometimes doing everything Christ asks me to do just isn’t easy. Because God is begging for me to understand him through his word and through prayer, and that means faithfully pouring over his word and prayerfully committing my day to his will. Sometimes though, I’d rather not do those things because sulking makes more sense or I don’t have time for a morning 10-minute bible study. Jesus interferes with the easy in our life and sometimes he talks about really hard things, like marriage and politics and death and disobedience. He says things that require more of me, but however or wherever I chose to relay the gospel means getting to know him and spending time with him. After all, if I don’t understand it, they won’t. How Do I Love Thee A&M? I had the opportunity this past weekend to visit my college stomping grounds and chat with some students about my experience at The Battalion, how I handle dealing with sources and about journalism in general. As I was navigating construction walkways back to the parking garage after the workshop, I thought about a few things. 1. I feel a little old. I didn’t recognize too many student faces and when I was introduced as the editor from “three years ago,” I realized how long ago that sounded. And the students looked so young. Do their parents know their kids are out? 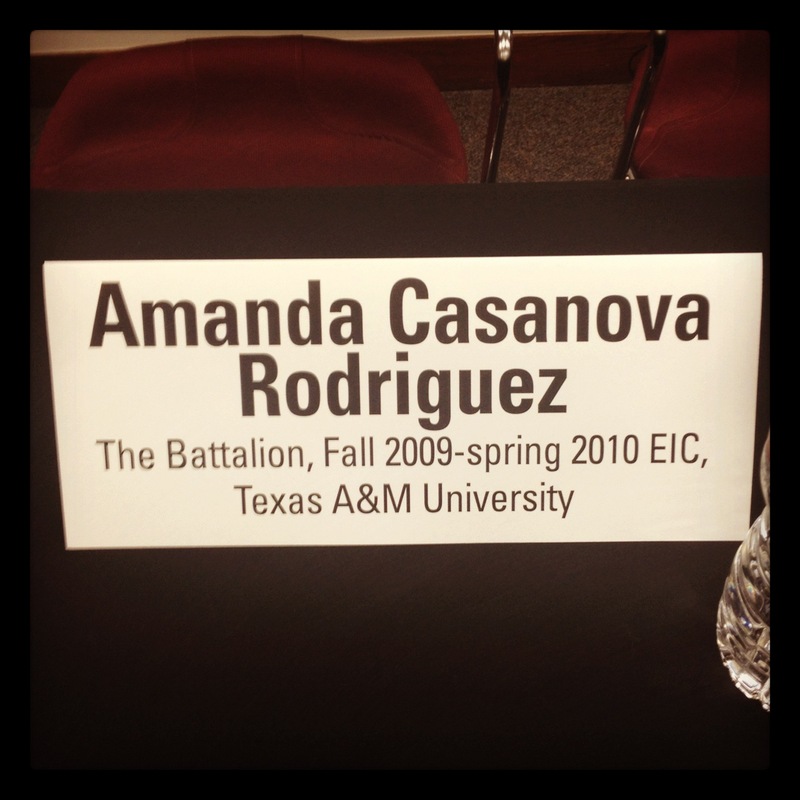 But my second thought was how I’d forgotten how much I love Texas A&M and my experience at The Battalion. There are things forever immortalized in my memory— late nights in the newsroom, napping in the (old) Memorial Student Center, playing jokes on my roommates and staying up way too late during finals. It’s still my favorite place. After all, I met some of my closest friends there, and best of all, I met my husband in Aggieland. If you knew me during my editor in chief days, you know I wasn’t the best girlfriend because my phone rang during dates and we ate dinner around budget and planning meetings and I had to run out sometimes at 1 a.m. to resend a page to the printer. I’m still in awe of how I snatched him up despite my crazy schedule. So this past weekend, when I went to take my seat before the panel discussion, I snapped this photo. I knew Derek would appreciate finally being a part of something that battled for my attention during college. My panel name card featuring my new extra long name. Then, for about half a second, I was slightly jealous of the Battalion staffers before me and the students unloading new sheet sets and mini fridges in Mosher circle. Because it’s an unparalleled experience. But then I may be biased because I got a cute engineer out of it.